We just deployed a bug fix that corrects an issue where you would receive an error when connecting GMass to certain Google Docs spreadsheets where an email address had more than 100 characters. We have corrected this now by truncating the value of any email address to the first 100 characters. 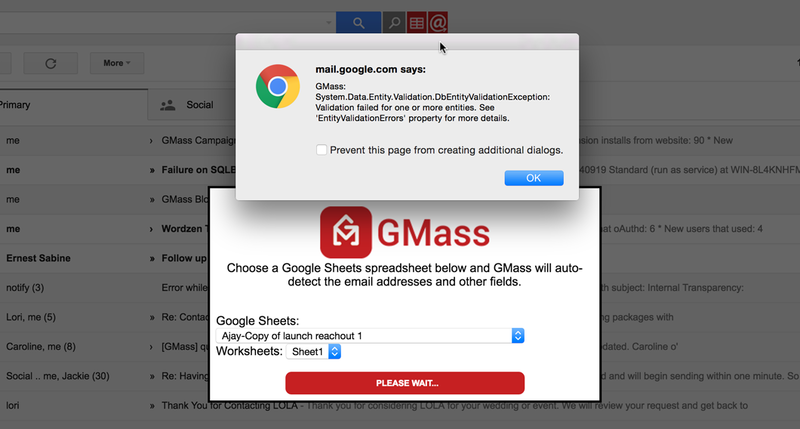 That way, GMass will still connect to a spreadsheet with a “bad” row and pull your email addresses and other fields, but any rows containing an email address value of more than 100 characters will be discarded in the actual sending process, since these addresses will likely be invalid. Here is an example spreadsheet with an invalid value in the email address column. In this case, the 4th row would be truncated, resulting in an invalid address, and none of the addresses in that row would be sent to. Note that other non-email address columns may still have values greater than 100 characters. For example, if you have a “Greeting” column, where the column stores a customized greeting sentence that is personalized to each email address, then this sentence can certainly be greater than 100 characters. Also note that GMass auto-detects which column stores your email addresses versus columns that contain other data (like Greeting, FirstName, LastName, etc.). You won’t need to tell GMass which column in your spreadsheet contains the email addresses to send to. Also, the column need not be named “EmailAddress” as shown in the example — it can be named anything. Am having a real-time issue with gmass right now. Anytime I try to connect a spreadsheet, it says “duplicate column in given worksheet”.